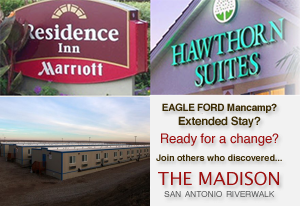 The Madison's fully furnished luxury condos and serviced apartments are situated in the geographic center of San Antonio, Texas. We are in the City's finest neighborhood, the King William Historic District, steps away from the San Antonio Riverwalk, trolley and bus transit, and minutes away from and some of San Antonio's largest financial, educational, entertainment, cultural and health care institutions. The King William Historic District is part of the Southtown area, San Antonio’s Arts District, and it is part of the City of San Antonio’s Urban Main Street Program of the National Trust for Historic Preservation. Visitors flock to Southtown for its eclectic blend of shops, galleries and restaurants, its historic sites and its cultural hotspots. It is also one of the busiest spots for First Friday celebrations in the downtown area. One of the most famous attractions in Southtown is the Blue Star Arts Complex, which includes a brewery, art space, a performance company and multiple art galleries. El Sol Studios is also a popular art space which showcases the work of the some of the finest artists in the area.